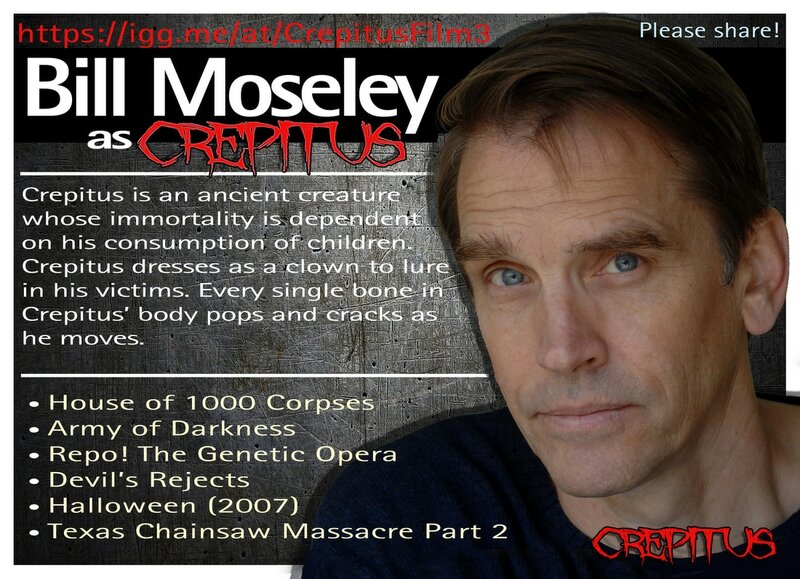 William "Bill" Moseley (born November 11, 1951), is an American film actor and musician who has starred in a number of cult classic horror films, including House of 1000 Corpses (2003), Repo! The Genetic Opera (2008) and The Devil's Rejects (2005). His first big role was in The Texas Chainsaw Massacre 2 (1986) as Chop-Top. On the HBO TV series, Carnivàle (2003), Moseley had a recurring role as camp cook, Possum. He also provided vocals for the band, Cornbugs. Chalet Lizette started out with modeling at age 6 and by age 7 she was already performing in horror, comedy, drama and more. She is a co star in The Sparrows: Nesting,and many more major films. Chalet has worked with major talent on all genre's. Chalet has the unique ability to memorize multiple roles and has been directed by a impressive list of Director's. She continues to book role after role because of her professional attitude and her abilities. Her ability stretches to not being typecast in one area or genre. She is also able to play multiple ethnic personalities. Eve is the youngest of six siblings. She grew up in Orlando, Florida and watched Greta Garbo films which inspired her to become an actress. Eve moved to Los Angeles at the age of 21 and began her acting career on stage. Eve is a passionate supporter of four charities very close to her heart including: Human Rights Watch, Amnesty International, Save the Children and Susan G. Komen Cure for Cancer. She currently resides in Los Angeles, California. ​A Cheboygan, Michigan native, Caitlin Williams' interest in acting began at just 7 years old, when she starred as Amaryllis in the Music Man. After that she was hooked. She has since played in a myriad of stage performances such as Maria in The Sound of Music and The Cat in the Hat in a Cheboygan production of Seussical. She has also had supporting roles in Cinderella, Will Rodger's Follies and The Rivertown Follies. She is a local celebrity! Caitlin attended The Missoula Children's Theater in Missoula, Montana for two years, The Young American's camp in Harbor Springs, Michigan for three years and The Blue Lake Performing Arts Camp in Michigan for one year. Caitlin will make her film debut performance as Eli in Haynze Whitmore's feature, Crepitus. Lance Paul was born on November 15, 1985 in Bridgeport, Connecticut to parents Vicki Jo Hoover and Robert Paul Hoover. Lance was raised in Naples, Florida. His late uncle was a theater teacher at the local high school and was Lance's main influence into the acting world. Lance moved out to Los Angeles, California in 2010 to pursue his acting and modeling career full time. 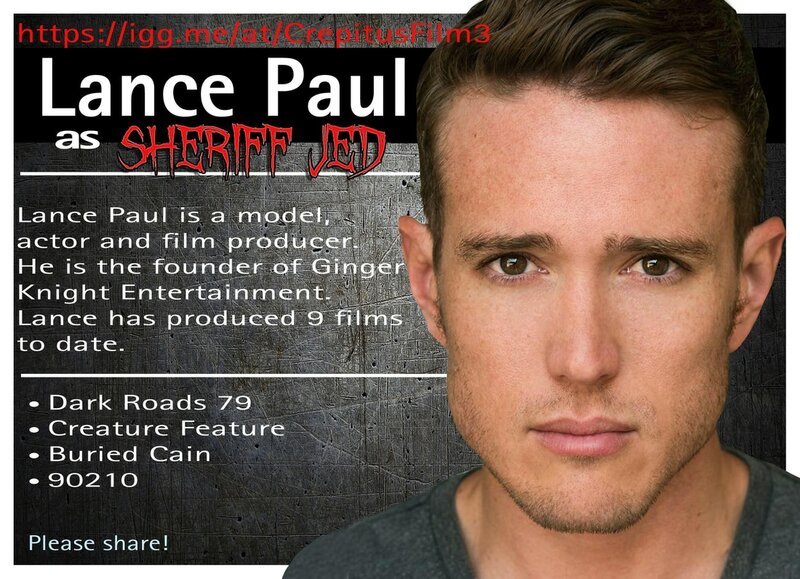 Lance Paul is best known for his recent role in Realm of Souls as Paul. He has also been a producer and storyboard artist for the films Realm of Souls, Perdition and Closing Doors. He currently resides in Hollywood, California. 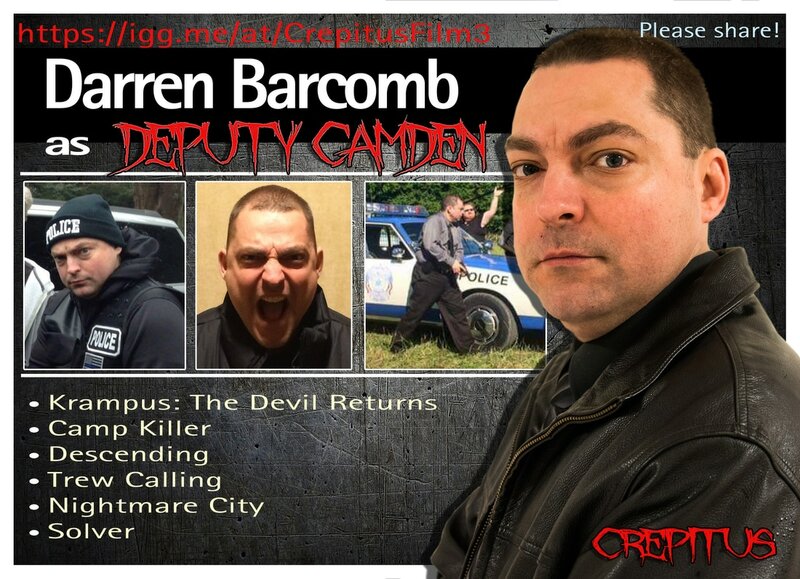 Darren Barcomb is an actor and producer, known for Krampus: The Devil Returns (2016), Nightmare City and Camp Killer (2016). Hailing from New York, Johnny Stevenson stands at 6'5" and 260 lbs with Native American heritage. Skills include film/television acting, stunt work, and theatre. Stevenson is also a practitioner of Carlson Gracie JiuJitsu. His first big break came as portraying the hulking woodsman "Monk" in Krampus 2: The Devil Returns.